Early promotional broadside map advertising a development in Oak Bluffs, Martha's Vineyard. 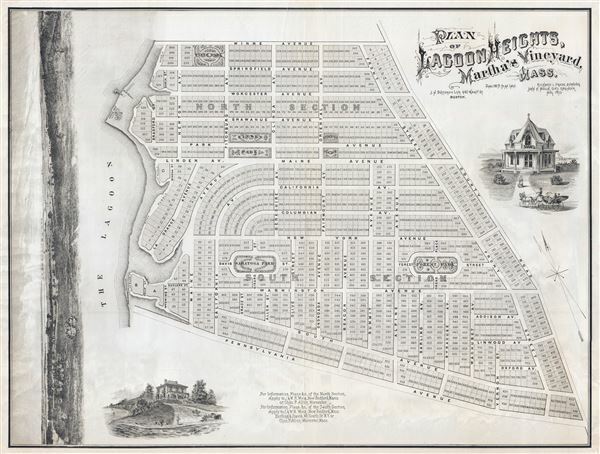 PLAN OF LAGOON HEIGHTS, Martha’s Vineyard, MASS. A beautiful 1873 promotional map of Lagoon Height, the area of present day Oak Bluffs, Martha's Vineyard, Massachusetts. The map consists of a detailed street plan with housing lots and parks, as well as wonderful vignettes of Victorian era summer homes. Along the left side of the map is a dramatic panoramic advertising the spectacular view potential home buyers might enjoy. A promotional imprint at the bottom center directs interested buyers to the attention of J. and W. R. Wing of New Bedford Massachusetts. The modern day town of Oak Bluffs was uninhabited until the early 19th century when, in 1835, it was selected as the site for Methodist and Baptist summer meetings. The meetings exposed the site as an extraordinary opportunity for development. The East Chop headland offered sweeping panoramic views of Vineyard Sound as well as easy access to the sheltered Lagoon Pond. The secularization of the headland was thus well underway. LAGOON HEIGHTS Comprises 200 acres of elevated, pleasant land, interspersed with several shay groves, with half a mile of water FRONT ON LAGOON POND, and extending easterly from the water to the county road connecting Eastville with Edgartown. This is a fine location on the Oak Bluff side of the pond, HALF a mile from Wesleyan Grove. Around the same time the Wings must have commissioned Richard Pease, a surveyor, and John H. Mullin to lay out the new development. The Boston lithography firm of J. H. Bufford compiled their surveys into this impressive broadside, which appeared early in 1873. It must have been an extremely attractive offering. Even so, the winds of fortune were not with the Wing firm. Around the same time this broadside map was published, Jay Coode and Company, a powerful bank in Philadelphia, became overextended building the Northern Pacific Railway and fell suddenly into bankruptcy, triggering the Panic of 1873. Facing a global depression and bank runs in major financial centers, J. and W. R. Wing found their Lagoon Heights development untenable. The firm shelved these plans, as well as most examples of this map, which is why today, when it does appear on the market, most examples are generally in very fine condition. John Henry Bufford (July 27, 1810 - October 8, 1870) was a Boston based lithographer and printer. Bufford was born in Portsmouth, New Hampshire. He apprenticed as an artist and lithographer at Pendleton Lithography (1825 - 1836) of Boston. In 1835 he relocated to New York where he took independent commissions from George Endicott and Nathaniel Currier, among others. Returning to his hometown of Boston in 1839, he took a position of chief artist with the firm of Benjamin W. Thayer, heir to Pendleton Lithography. He probably married Thayer's sister, Anna Melora Tufts Thayer (1808-1878). Bufford has been highly criticized as an engraver, with one historian, David Tatham, stating he had 'a mediocre sort of craftsmanship at best' and 'no very special skills as an original artist.' We, however, find no justification for this harsh criticism. Instead Bufford gravitated toward business and management. By 1844 Thayer's shop was renamed J. H. Bufford and Company. The firm specialized in decorative sheet music, panoramic views, illustrations for books, retractions of paintings, and commercial printing. Bufford is credited with being one of the first employers and mentors of the important artist and engraver Winslow Homer. Bufford died in 1870, passing on the business to his sons Frank G. Bufford and John Henry Bufford Jr. These young men, operating under the imprint of 'J.H. Bufford's Sons, Manufacturing Publishers of Novelties in Fine Arts', expanded the firm with offices in New York and Chicago. The firm finely closed down around 1900. Very good. Minor marginal reinforcemet top center. Rumsey 5306.000. Boston Athaneum, D B64M363 Pl.l.1873.